Cleveland has always taken pride in its burgers -- not so much that we can’t admit the rest of Ohio has some pretty good ones too, but still. 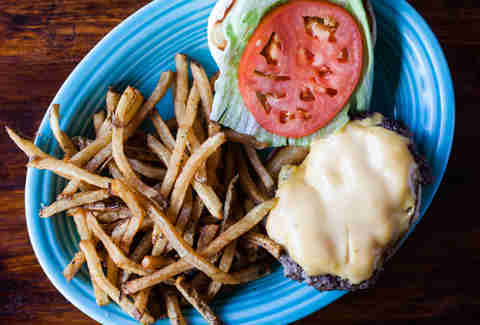 Whether you’re looking for time-tested diner classics at old-school drive-ins or gourmet gastropub fare, Cleveland's got no shortage of spots to go get a great burger. Here's everything you need to know about the absolute best of them. 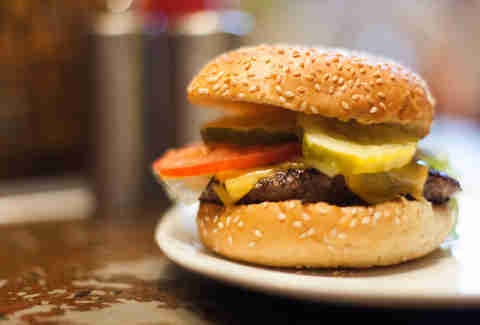 By this time, you’ve already heard from plenty of national food critics that Greenhouse Tavern can make a mean burger. Who are we to disagree? Especially when James Beard Award-winning chef Jonathon Sawyer is topping his grilled Ohio lamb burger with gloriously stinky cheese fondue, and Champagne shallot. Oh, and the tangy yogurt that comes with it is meant for your fries, but we won’t judge you for lavishing it all over this beauty. If there are two things Cleveland takes seriously, it’s our breweries and our pierogi. Fat Head’s is already a mainstay in our booming craft scene, but that’s not enough for the crew here. That’s why it tops the already great sautéed onion-, crisp bacon-, and horseradish sauce-topped Parma Sutra burger with a bed of pillowy dumplings. It’s the best of both worlds. This old-school joint has been around since the ‘20s when it opened in Euclid, and the fact that it’s still going is reason enough to keep the burgers just as classic: the legendary double-decker Big Guy, layered with cheese and the requisite crisp pickles, keeps diners flocking to the new East 200 Street location to sink their teeth into nostalgia. It’d be easy for a place to get lost on the West Sixth strip, in a haze of nightclubs and late-night eateries. 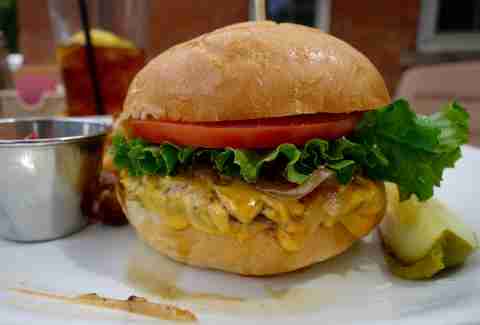 And it’d be even easier for a burger to get lost in a seafood restaurant modeled after a Key West crab shack. 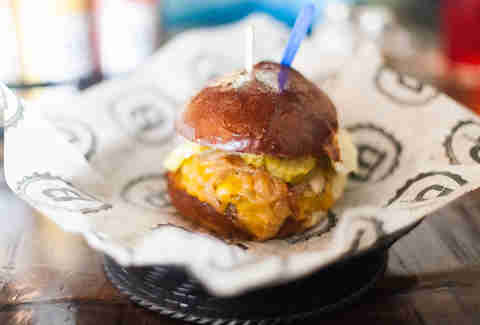 Luckily, this place is putting a house-made crab cake (with Key lime aioli) on top of its surf-and-turf burger, and then throwing it all on a brioche bun. You’ll always find your way back to something that delicious. Yes, Tremont is flush with new, trendy hotspots. 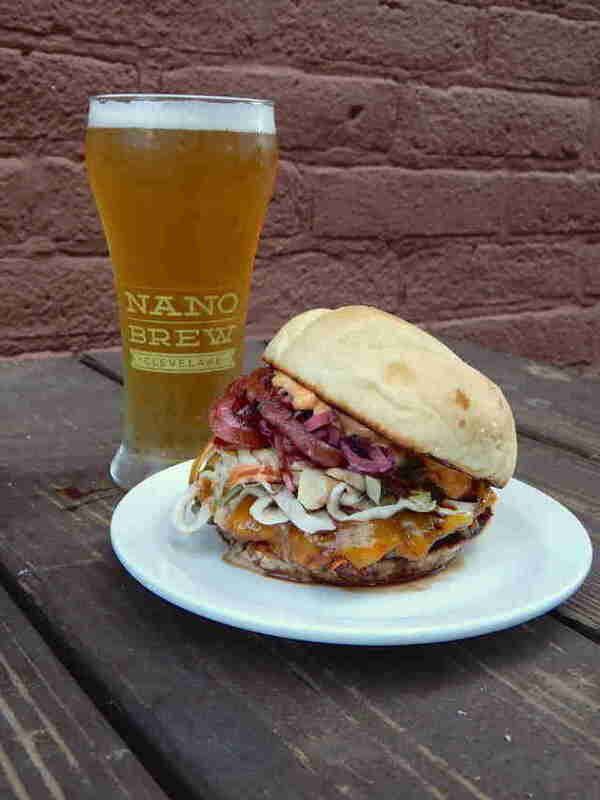 But there’s something about this unpretentious place, which happens to have one of the best-kept-secret panoramic views of Downtown, and by “something” we mean the Hoopple burger: it's topped with grilled salami & ham, provolone cheese with all the fixings, and Hoopples' house sauce. You already know Food Network star/local hero Michael Symon loves meat, so it’s no surprise he’s getting a rep for serving some of the best burgers in America. 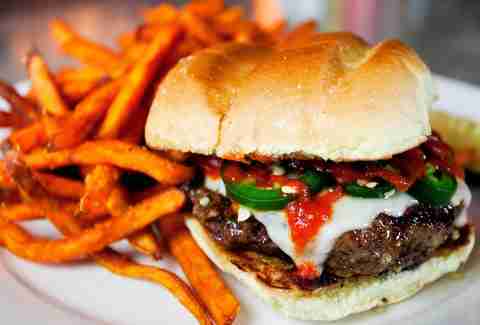 The Yo!, the signature burger from B Spot’s lengthy lineup, offers a double dose of fried salami and capicola, plus hot peppers, shasha sauce, and provolone cheese. 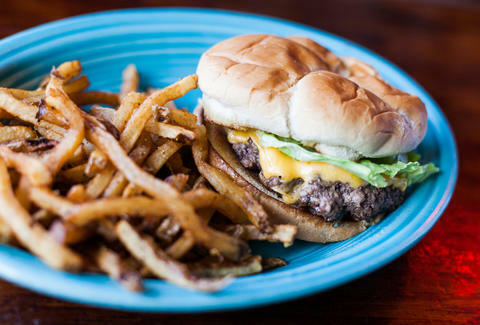 Unassuming and off the beaten path, this neighborhood watering hole has all the makings of the perfect burger-and-a cheap-beer spot. It’s laid-back enough that it has a whole build-your-own burger menu, but we recommend going with its namesake option, the Eastland, which starts with fresh-ground round and piles on a generous serving of salami and Italian dressing. Burgers are plentiful in this neighborhood, from unassuming diners and dives to a bumper crop of hip additions, but this place, which boasts constantly rotating tap options, monthly burger specials, and seriously creative drink concoctions, has ‘em all beat with this favorite -- The Devil Made Me Do It -- that comes topped with four slices of bacon, house-made deviled egg salad, pepper jack, and spiked with smoked paprika mayo. There’s a reason this grass-fed beef-based local chain has been unstoppable, and the Forester burger may or may not be that reason. Either way, with wild mushrooms, caramelized onions, crispy shiitake mushrooms, and truffle aioli, you should definitely eat it. The faint of heart need not proceed. As a relative newcomer on the scene, this approachable Cleveland chain has been pulling one artery-challenging stop after another, like putting a hefty patty between a pair of glazed donuts, then adding honey-peppered bacon and American cheese like it does on the Luther. Or, if you prefer your meat encased in a different breakfast food, try the Eiffle Toast, where donuts are swapped out for French toast. No one bats an eye at this nook’s self-appointed claim to the throne of gourmet burgerdom, not when it's spent 40 years turning out monsters like The Market Burger, appropriately named considering its proximity to the local landmark West Side Market, made with braised short ribs, béarnaise, and fresh arugula. Brisket is the name of the game at this Gordon Square restaurant, where ingredients are plucked straight from its own hoop house and gardens. With the number of foodie destinations in this neighborhood rising by (what feels like) the second, sometimes it’s nice to just kick back with a great burger without sacrificing the farm-to-table feel. Toast gives it a sophisticated twist with locally sourced raclette and tomato jam offered during happy hour, 'til 6:30pm. Sure, West 25th is well-known for bar hopping, but anyone who’s strolled through the West Side Market-anchored neighborhood knows that none of these establishments skimp when it comes to food. Take a seat at this bicycle-themed bar and you’ll find no lack of choices, but your servers will probably tell you: “Just stick with the burgers and you won’t be disappointed." And for good reason -- the menu’s centerpiece patties strike the perfect balance for those who are looking for the sweet spot between thick and thin. Turn on, tune in, and drop out with the Acid Trip topped with pickled onions and slaw or relive your childhood with the PB & J built with peanut butter and bacon jam. If you’re looking for a place you might cross paths with the Fonz, this Akron drive-in built in the 1950s is all in the spirit of Happy Days past. 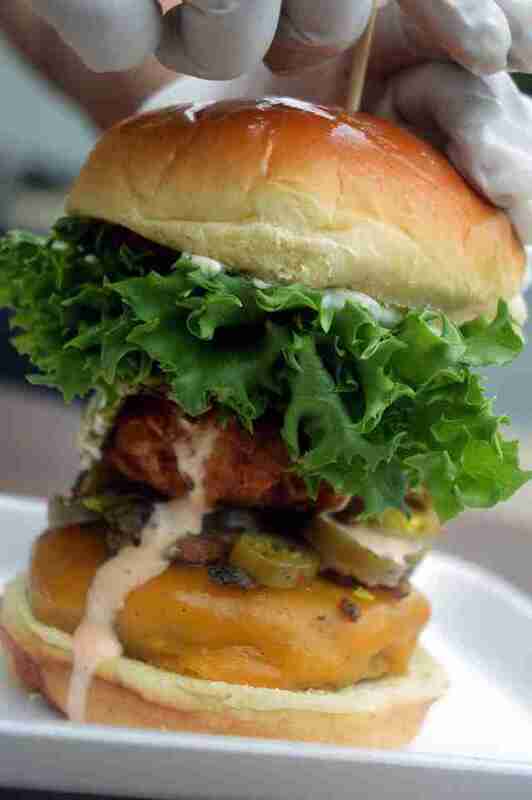 And at the center of the time travel trip is the SkyHi, its famous double-patty burger. The SkyHi, drowning in "special sauce," is the star here, but don’t sleep on the battered onion rings made from its own original recipe with just the right amount of crisp. You don’t need a DeLorean to find your way to these cheap eats -- just an appetite for good old-fashioned hamburgers. And as they say, they don’t make ‘em like this anymore. 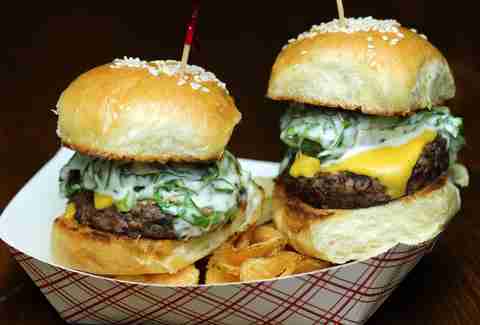 We’re calling it now: the ladies of Betty’s are the new queens of Cleveland burgers. 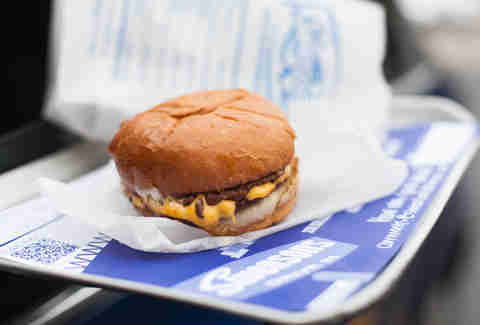 This mobile operation -- which seems to be everywhere these days -- has mile-high burgers and homemade cheesy tater tots. These delicacies come in all kinds, packed with barbecue-ready onion rings and pulled pork, or brunch-inspired egg and bacon jam. And that’s just two of them! We recommend sampling each -- that is, after you master the art of fitting one in your mouth. Located in a small shack smack in the middle of Playhouse Square, Zack Bruell’s restaurants allow commuters to get a taste of each his spots without walking too far from their cubicles. There’s the Chinato with mortadella and mozzarella cheese, balsamic onions, and tomato sauce, or the L’Albatros with caramelized onions, roasted peppers, Swiss cheese, and béarnaise (similar to what you’ll find on the happy hour menu at each). The real kid from Akron might be the infamous, grand Galley Boy. No meal is quite as synonymous with the area, and this burger joint, built in 1934, is more than just still kicking. 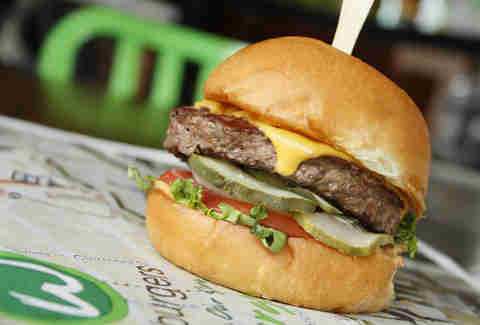 The classic double decker Galley Boy comes with a green olive on top, doused in secret sauces. We’re not quite sure what those are (something between tartar sauce, relish, and Miracle Whip? ), but they’ve been enough to keep people coming back for more a century. These days, if you’re not willing to trek to the original location or one of the handfuls of outposts, you can even grab a burger from the freshly minted Swensons food truck. Wash it all down with -- what else? -- a sweet, rich milkshake. 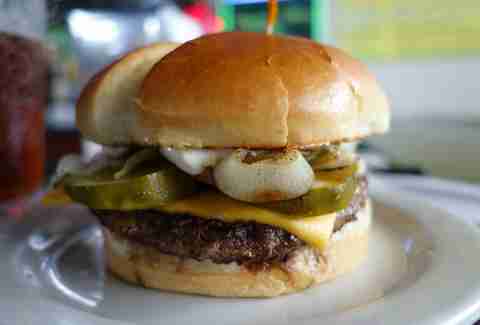 This no-frills, cash-only spot has flown under the radar for the most part but is known among locals as having the best burgers around. It's also low-key famous for its wholesale chili, which you can get on top of The Kiev burger amidst chopped white onions, sour cream, and shredded Monterey cheese, all of which gets sandwiched between two hefty pieces of Texas toast. Graffiti has always been playful, and that characteristic is one of its finest traits. (That, and it has one of the most lovely patios in Cleveland. And that dessert with fried cookie dough, ice cream, and candy. We could go on all day.) 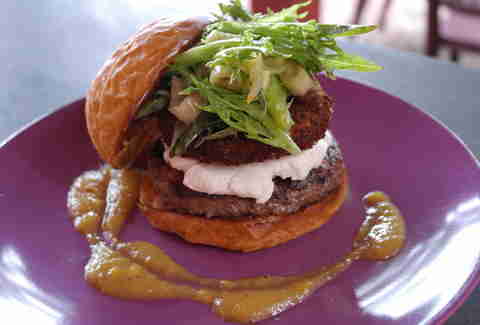 The Angus beef Graffiti Burger comes topped with local goat cheese, pickled banana pepper, and capped with a fried green onion. 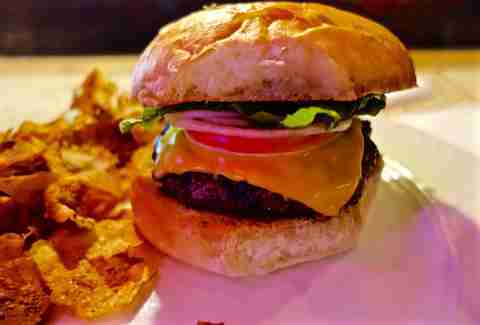 This tucked-away restaurant is known for being bright and colorful -- this flavor-punched twist on the classic burger is no exception. While there are no full-sized burgers on the menu, this contemporary public house and brewery offers aged beef sliders made from a special butcher’s blend of aged rib-eye, brisket, and chuck then dressed with pimento cheese, spicy mayo, house pickles, on tiny brioche buns. All of the meat is pasture-raised and the animal is deconstructed (read: butchered) on the spot for unrivaled freshness. They take the prize for the most decadent small bite in the city. 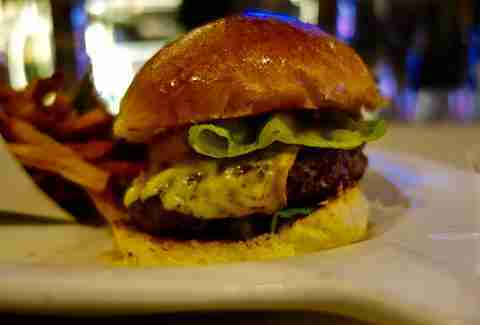 Burgers are the name of the game at local chain The RAIL. Sometimes, when operations grow to franchised proportions, they lose sight of locally sourced ingredients. Not so here, where buns are filled with local beef patties and chicken, farm-fresh eggs, and Ohio thick-cut bacon. It doesn’t hurt that this burger joint excels in the art of having something for everyone. Bourbon barbecue sauce and tobacco onions top The Bootlegger, while the Bonfire Burger ups the heat with house-made jalapeño relish, Sriracha, and a side of house-made roasted habanero sauce. OK, this one’s a bit of a novelty, but if you haven’t been to the brand-new franchise owned by actor Mark Wahlberg and his brothers, honestly, you’re missing out. Wondering what the working-class Wahlbergs grew up on? Well, thanks to brother Paul’s “food epiphanies and revelations” now you can taste his take on it, comprised mainly of burgers pronounced in a Boston accent. Take the OFD (Originally From “Dorchestah”) with a half-pound patty, bacon, mushrooms, Swiss, and tomato jam. Making its way onto our National Burger Critic's “Best in Cleveland” rundown, this cozy quarter is located just around the corner from its upscale steakhouse brethren. JLB doesn’t have any of the pretension of the other Johnny’s locations, known for fantastic Italian fare and veal entrees. What you’ll find here is an All-American half-pound burger with optional cheese, cooked to your pleasure. With its no-nonsense take on the classic, this place has stolen the heart of many an enthusiast. Nikki Delamotte is a Cleveland-based pop culture writer who loves podcasting and burgers. And probably podcasting about burgers. Find her on Twitter: @nikkidelamotte. Rachel Hunt is the contributing food editor at Scene Magazine and likes to eat, a lot. You can see some photos of her "research" by following @workinggoth on IG.